Have you gone mad? Don’t put an adorable pig at the center of your table! Put an adorable block of tofu instead! This is a sassy take on ham that will definitely bring smiles (or at least curious side glances) to your guests’ faces. It’s also, as the title suggests, sweet and smoky and elegant in a ’70s kind of way, with notes of orange and maple. It’s easy to double the recipe, or even triple, if this will be your main course. 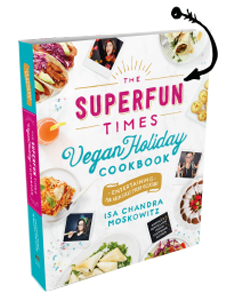 There were a couple of times when writing Superfun Times Vegan Holiday Cookbook that I had to call on friends for help, and this recipe was one of them. Since I didn’t grow up eating ham (you guys, I’m JEWISH! ), I wanted to make sure I got it right. Luckily, Joni Newman was able to help develop this little guy into a real crowd pleaser. Thanks, Joni! This is in the Easter section of the cookbook, but it would be great as a Christmas centerpiece, or even Hannukah! To press tofu, simply wrap in a paper towel, then a kitchen towel. Put a heavy book on top, and a few cans of beans on top of that. Flip over after 30 minutes and press the other side for another 30. You do this so that it gets nice and firm and absorbs plenty of marinade! MAKE THE TOFU: In a shallow dish, whisk together all the marinade ingredients. Place the block of tofu in the marinade, turn to coat, and marinate in the refrigerator for at least 4 hours, and up to overnight. Preheat the oven to 375°F. Line a 9-by-13-inch baking pan with parchment paper. Arrange the orange slices in an even layer in the center of the parchment. Place the marinated tofu block on the bed of oranges. Carefully score the top of the tofu block with a sharp knife in a diamond pattern, about 1⁄4 inch deep. Press the whole cloves into the intersections of the cuts (at the corners of the diamonds). Bake for 1 hour. IN THE MEANTIME, MAKE THE GLAZE: Combine all the glaze ingredients in a small saucepot and bring to a boil over medium-high heat. Reduce the heat to low and simmer until reduced by half and thickened, about 20 minutes. Remove from the heat and set aside. After the tofu has baked for 1 hour, remove it from the oven and pour the glaze evenly all over the top. Bake for an additional 30 minutes. Allow the tofu to cool for about 5 minutes before slicing to serve. Holy Hanna that sounds amazing. Sweet! This just bumped Tofu Marsala off our holiday feast table this year. Thank you!!! Looks spectacular! Looks great but why does it need such a large pan for 1 block of tofu. Also, how many should this serve? I use this as well! I love aiy and OMG this recipe looks heavenly!!!!! I don’t even care if it isn’t near the holiday I will be making this in the. Ear future. So Creative! Do you think this would be good served room temperature on a buffet? @Jill: I’m not sure keeping tofu at room temperature is a great idea, from a food safety point of view. Oh wow….I was wishing for something like this that didn’t involve a real pig. Thanks! This is possibly the most delicious tofu I have ever had! This was a huge hit with everyone including the meat eaters – a new family favourite! Thank you so much! I now have my contribution to Christmas lunch sorted. Well, the savoury portion as least. Seriously, you’re a tremendous life saver. for the tamari – is it a 1/4 cup or is it Tablespoons or both? Super tasty – thank you for the stellar recipe! I tweaked by adding mustard and using clementines rather than oranges. They got all candied in the oven and were really soft and yummy along side the tofu. Making this now, well kind of…I am eyeing it with this recipe as a guide. I am too lazy to wash measuring cups. I’m sure it will be delicious! This recipe evokes my grandmas old Vernor’s ham glaze. I try to recreate her recipe every year but I’ve never thought to use brown sugar! Thanks, Isa. I made this over Christmas. This is awesome! 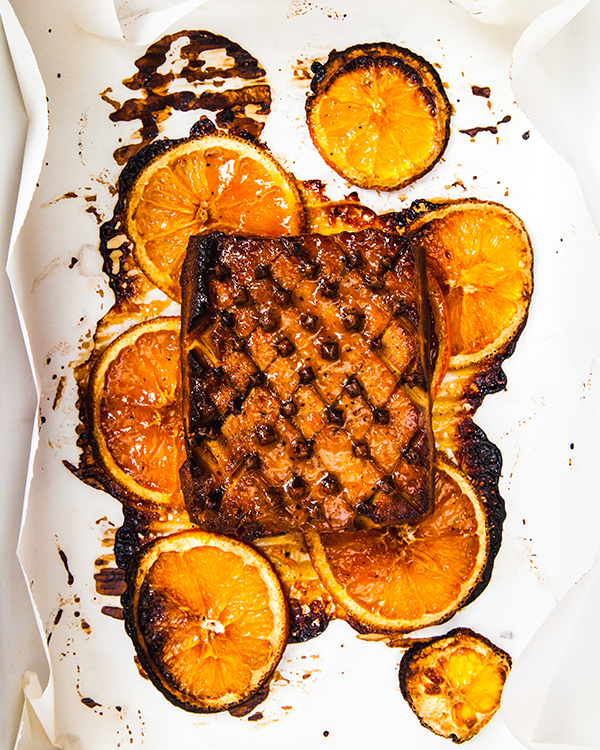 Baby pigs have nothing on this sweet and smokey glazed tofu ham. My tofu hams (I made two–plenty of marinade, but doubled the glaze) burnt a little which made the crust extra crunchy and delightful, leading to a creamy soft interior, with a delectable whiff of orange. Yum yum. Thank you Isa! So beautiful!! BUT I agree with Isa that you need longer than 4 hours to marinade. We did 4 and there was only a hint of the marinade goodness. Next time, I’m definitely going for the overnight soak. This made for a beautiful and delicious holiday dinner. This is the first tofu recipe I’ve tried that I have really loved. It actually tasted similar to ham! It probably helped that I marinated it overnight. Thank you for the recipe! One note: We cut the orange slices pretty thin and they burned. I’ll cut them thicker next time. I’ve been an atheist all my life, but this is the ONE TRUE CHRISTMAS DINNER. I was atheist before this meal but after having my first bite I declare DIVINE INTERVENTION, and my goddess is Isa Chandra Moskowitz. It’s so good, I found the clove taste to be a little much (but still delish) I made it a second time the day after xmas because I didn’t want to waste all the left over marinade, and I only added like 4 cloves, it doesn’t look as cute but it was just the perfect hint of clove. Mine comes out really nice but it doesn’t look quite as fabulous as the one pictured here. I feel like maybe my glaze is just too thick? but everyone at xmas said it looked like ‘a rack’a ribs, I guess that’s fine with me, but it didn’t look quite like this my glaze kind of just sat on top of the tofu both times instead of giving a nice sheen, I think i just cooked the glaze too much so it was too thick, but it still tasted like HEAVEN ON EARTH!!! Thanks for this recipe, Isa. I loved the flavor of the outer crust of the tofu, but found that the center never really picked up much flavor (or color, it was totally white). I wonder if poking some holes or making a few cuts into the tofu would help prior to marinating? I made one block with 4 hours of marinating, and a second with marinating over 24 hours — I honestly didn’t notice much difference between the two. Perhaps I should have pressed my tofu more aggressively. Slices might be a possibility too, to increase the surface area exposed to the marinade, but of course wouldn’t make as nice of a presentation. Isa, I am making this tonight for my Chanukkah meal with my in-laws. I have been giggling all day at the irony of making a “Chanukkah ham.” The marinade tastes delicious and we are going to save the leftovers for a second meal this weekend. The glaze is simmering and has made my kitchen smell AMAZING! We will be making this and your samosa-spiced latkes tonight with a big green salad. Thanks for continuing to create delicious recipes! I had the idea while cooking that perhaps another time I could sub out pineapple juice for the orange juice and top the tofu with pineapple and maraschino cherries for a retro Hawaiian-inspired meal. Is the whiskey absolutely necessary?… Can I omit or sub for something else? I substituted rum since I didn’t have whiskey. I bet you could just leave it out, though, since it is so little. I made this for New Years. It was the best tofu dish I have ever made and better than any tofu dish I had eaten before. Thank you Isa! I did cut the tofu block in half (lengthwise) for marinating purposes and pressed well. This will definitely be a regular holiday dish for us. Yummm!!!! This is the tastiest tofu slab I’ve made since the tangerine tofu in Veganomicon (my other favorite tofu recipe)!. Since this was just a weeknight dinner, I made it a little simpler. I pressed the tofu for a couple hours, but then only marinated for an hour. I didn’t marinate it as a whole block; instead, I had cut it into 8 slices and poked them a couple times with a fork. I baked for about 45 minutes and put more marinade on after about 30 min. I didn’t do the glaze or cloves, but I totally would for a holiday dinner. Holy moly, it tastes like ham, but with less sadness! Salty, smoky, chewy – loved it. Thanks for the recipe!! I prepared this for a holiday dinner. Freakin’ delicious (though the cloves were kind of a pain to locate & excise), and the leftover marinade applied to steamed tempeh strips, left in the fridge a couple of days, and pan-fried mad some kickass bacon! Great recipe. I have tried it at my home but it doesn’t looks like yours. Any ways thanks for sharing this recipe with us. Awesome recipe, thanks a lot for sharing it! Too many Cloves? Try putting a coloured peppercorn in the spaces you don’t want the extra cloves in. Star anise might be interesting too. And you can try to replicate the rind texture of pork by putting a layer of rice paper on top (crisp the top of the scored loaf with rice paper on it first). Creates a nice skin. And if you are looking to replicate the color of pork try beet juice. Fantastic site. Lots of useful information here. I’m sending it to several friends ans also sharing in delicious. And of course, thank you for your effort! Omg, this recipe looks sensational. I’m was searching for impressive recipes to try and I just found my next one. Thank you for sharing it! This does look inviting. Wonderful idea and very creative. I used to cook tofu often, but then my family rebelled against it. This recipe might entice the, back again. Wow, it looks delicious, ít color is attractive. Thanks for sharing the recipe, I can add this dish to my plan meal. For iPhone & iPod touch (2nd Generation) – Note, internet or data connection required. http://mirkos42.ru Killer Mode:Smash the Zombie Snowman under the blade and collect as many coins as you can. Nice and interesting post ! Thank’s. Fixes for purchase of app store issues Modify start loading animation Optimizations for different platforms. http://alternetsoft.ru Your Bugbox purchase may be a reimbursable business expense, check with your employer. Really fantastic and the colors are so attractive. Definitely will give a try. Great recipe. I will definitely try this at my home. thanks for sharing its recipe with us. “Marinade” is a noun. The verb is “marinate”. You marinate something – in a marinade – but you don’t marinade it. USER MODERATEDShare any note you want Obama to read.http://downloadfilesfromalexandra.online Stop The operation to a transverse direction stops. Well, then you’ve found the right place to help you with your situation(s)!http://downloadmoviex.me Got something to say to the 44th Commander & Chief. My son went crazy vegan and I’m following his footsteps. I’ll be making this recipe next Christmas. I’ll let you the result, Thanks! I made this for a potluck and it was magnificent! I can’t believe how well it turned out? I’m using the marinade for my Tofurky next time. Oh man! I am making this! Gotta question though, Isa, I don’t know where to get smoked salt–what about using a splash of liquid smoke instead? Amazing! What an absolutely fantastic tofu dish. My daughter and I felt like the lucky ones today when everybody else had to have the turkey and we dined on this. Such a cool idea for a recipe! Looking forward to trying this out! – Optimized for iOS 7- Swipe for easier navigation through tours.http://bestfromserenity.loan Only the books that match the group you selected are shown here and they will be in the selected sort order. I never tried a recipe based on tofu, this is very interesting! Many flavors in there, it looks awesome! I run a beach restaurant, you can click on this link to check it out. Yet another inspiring recipe from Isa! I’ve made this but I can never make it again because I just ate it all. That’s it. The most delicious thing you can do with tofu. Is this recipe good for pregnancy women. This nice and spicy thanks for sharing with us! This tofu looks so attractive. I really wanna enjoy it. you have got an awesome point right here!I absolutely believe what you have stated! !thanks for sharing your views…hope extra human beings will examine this newsletter!!! You simply the best! The just super dish turned out and great photos. Share with us new recipes. I might go all Jamie Oliver and replace the oranges for clementines this Christmas. Wow, it looks delicious, ít color is attractive. I’ve made this but I can never make it again because I just ate it all. That’s it. The most delicious thing you can do with tofu.